Costa has pretty exacting standards when it comes to delivering the perfect cup of Coffee to their customers. There are 100’s of varieties, but Costa uses just two which are all sourced on their farms which are 100% Rainforest Alliance accredited. Costa takes the customers’ brand experience seriously too and know it’s not just about the quality of the coffee that impacts it. Just as important is the positive impression all their customers have whilst in-store. And for that it boils down to the quality quality of their Baristas and Team Members. They want people who love their coffee as much as the customers do. That love the aroma, and the taste and are inspired by how they source their beans, and the pride and passion that goes into every cup. We took this premise and devised an eye-catching piece of creative recruitment marketing to link the two key elements. 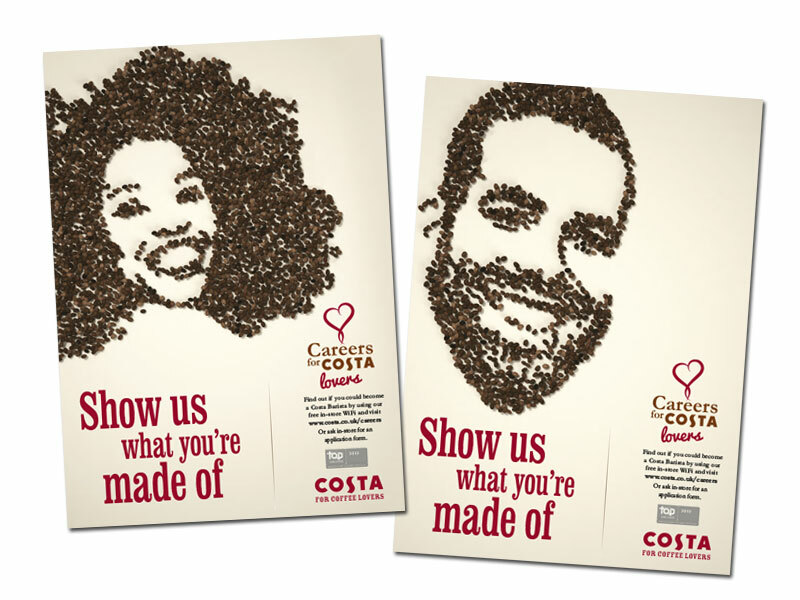 It was a fun shoot but quite a painstaking one using hundreds of arabica beans to create images of potential employees which was then used on a suite of employer brand materials that were displayed and dispensed in-store. We even had people contact us saying that the images were uncannily realistic and looked like themselves or people they know. They certainly made for a great cup of coffee when they were ground down after the photoshoot! For another highly successful creative recruitment advertising campaign see our Manager case study, or our Whitbread employer branding case study.